This article accompanies the presentation of Eduardo Kac's Reabracadabra as a part of the online exhibition Net Art Anthology. Few people remember, but many of the online activities associated with life in the twenty first century were already possible in the 1980s. Finding the cheapest flight and paying for it, checking the stock market, searching databases, chatting, reading the news, and self-publishing your work—all of this was possible with a new medium called videotex. You could use it with a remote control for your TV and a special set-top box, or with a terminal. It was a kind of protean version of the World Wide Web, and many politicians and business people were more than eager to fund and explore the new potential that videotex brought forth. Some of that funding went to artistic exploration, and a few artists experimented with this futuristic technology. This played out differently in each country that rolled out the network. In France, a videotex network called Télétel was created and relied on a special terminal, Minitel. Eventually, Minitel also became the name of the network in popular speech. To speed public adoption of the network, French Minitel gave away terminals for free, aiming to finance the program through subscription and usage fees. Users could set up their own microservers that others could dial into directly, like a dial-up bulletin board system, which fostered a culture of user-generated Minitel content. Videotex was more centralized in countries like Brazil and Canada, where users needed to go through an institution or company that had a Minitel microserver in order to publish videotex works. In Canada, this didn't stop artistic experimentation; the artist collective Toronto Community Videotex was quite active in videotex production, using a standard called Telidon. In Brazil, where the French Minitel system was adopted, the situation was complicated by the lack of accessibility of private phone lines, at that time still a rare and valuable commodity. As a result, videotex was mostly used in public terminals in libraries and shopping malls. Despite these obstacles, a number of artists experimented with the new network, known as Videotexto in Brazil. Among them were Julio Plaza, an artist and poet who curated a selection of Brazilian Videotexto artists for the 1983 Bienal de São Paulo, shown on special terminals in the biennial building and on the public network. The Livraria Nobel bookstore set up a permanent videotex gallery in 1983, Arte On-Line, which was featured on terminals in the store itself. These exhibitions could be accessed from any public or home terminal by entering a special code, similar to today's URLs; these would have been advertised through traditional means such as newspaper articles or flyers. Of the Brazilian artists who took up videotex, one who did it with great conceptual clarity was then 23-year-old artist and poet Eduardo Kac, who first showed on Arte On-Line in 1985. Kac had previously experimented with holographic poetry, and the new medium of videotex was a natural step, given its text-centric qualities. Just like videotex’s sister technology, teletext, and some home computers at the time, graphics were based on text characters rather than pixels. Graphics had to be typed using punctuation marks and typographic signs like in ASCII art, but Minitel also offered semi-graphical characters such as▝ and ▙. So it was possible to work on a pixel-by-pixel level, but it was a painstaking production process, “closer to a medieval mosaic than some futuristic telematic system.”1 To further complicate matters, the Minitel terminals that were available for accessing the network were "dumb" (able to display information, but not perform any operations), so the actual production work had to be done on special editing stations that in Brazil were only available at a few large organisations such as telephone companies. When users of Brazilian videotex accessed Reabracadabra, they would see diagonal lines appear on their screen, which were drawn to form triangular shapes that eventually grew into the letter A in 3D. The consonants of the poem's title, R, C and D, orbited around the A, just like particles around a nucleus or planets around the sun. Reabracadabra built on Kac's previous work in holographic poetry, which drew inspiration from poets associated with the Neo-Concrete movement in Brazil. The Neo-Concrete poets argued that a poem should be understood as a set of elements within a larger environment, including the reader themselves. He was fascinated by figures like Ferreira Gullar and Hélio Oiticica. Oiticica’s Poema Enterrado (Buried Poem) (1959) involved the viewer in excavating a text entombed in the poet’s yard. With Reabracadabra, the Videotexto network offered a new kind of environment within which users might find his single word. After exhibiting in Arte On-Line in 1985, Kac's interest in the possibilities of videotex continued, and in 1986 he co-curated another videotex exhibition with artist Flavio Ferraz, "Brazil High-Tech," which could be accessed on the network using the code "RJ*ARTE." Eduardo Kac, Reabracadabra, 1985. Courtesy the artist. Videotex gave Kac the opportunity to move beyond the work of the Xerox-focused conceptual artists of the 1970s. "The network enables us to create immaterial work that privileges interpersonal communication as an artistic strategy," he later told an interviewer. It was essential that the work did not have an original; that “the same pixels were shown to the artist and the audience.”3 He considered this as a step toward a new digital immaterial logic of production and reception that later flourished in other digital media. Minitel, however, faded away in Brazil, and was shut down in the 1990s. So there was no longer a home for Reabracadabra; no network for the net art. 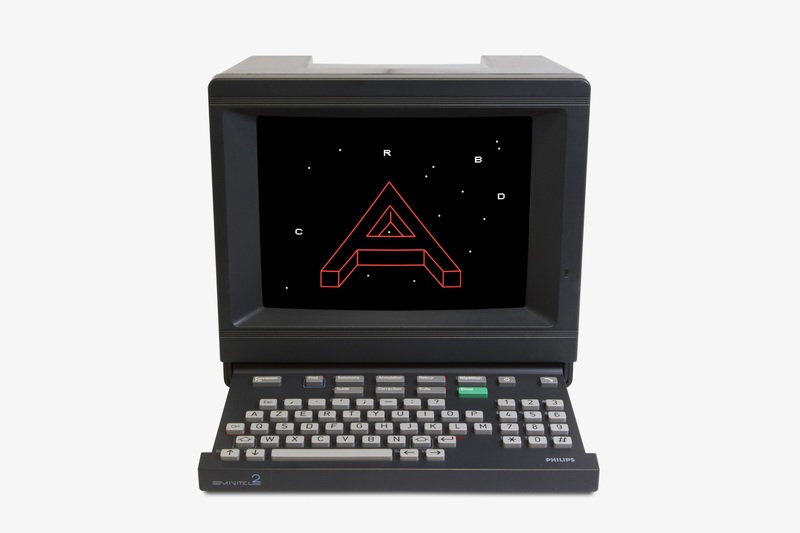 The data for the characters that made up Reabracadabra was saved on an 8-inch floppy disk, but Kac lacked access to the proprietary Minitel editing platform necessary to run it. There were photographs of the work, though, and after many years of searching Kac found a research team (PAMAL, in Aix-en-Provence, France) that helped restore the piece based on the salvaged data and photographic documentation. The code for each text character—the videotex equivalent of its ASCII-code—was typed in by hand, frame by frame. This was converted into a datastream adapted for the Minitel, transmitted into a working Minitel unit using custom-made hardware that simulated the original Minitel signal, and capped to the data speed that the phone lines provided at the time. The work is now restaged on the same model of terminals as in 1985, to make it look identical to the old version. Somewhat paradoxically, there is a lot of materiality to a piece in which immateriality was a key concept: platforms, interfaces, protocols, cables. But one key aspect of the materiality is not there: the network. What used to be publicly available in 1985 is now accessible only in Kac's specially retrofitted Minitel terminals. This is a fundamental difference between the new and the old Reabracadabra, but how do we make sense of it? Is Reabracadabra now a resurrection or a simulation of the old version and if so, does that make the old version an original? For Kac himself, there was never an original. And perhaps his immaterial framing of Reabracadabra, despite the material aspects brought forth by its resurrection, is even more relevant today. But for net art in general, Reabracadabra raises questions about networks, ownership, ontology, materiality, and preservation. What happens to net art when—not if—the network disappears? Eduardo Kac, Reabracadabra (1985). This video, from 2016, is accompanied by Kac narrating the development of the work. 1. Kac, Eduardo, Phone conversation with the author, 10 October 2016.